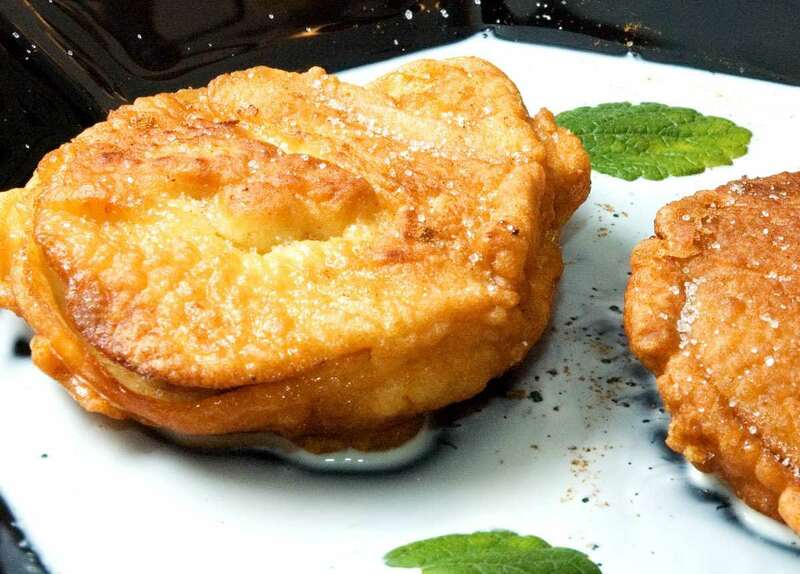 Apple Pancakes are slices of apple, dipped into pancake batter, deep fried and sprinkled with sugar and cinnamon. Enough for a main dish but also nice as a dessert. Combine eggs, sugar, salt and vanilla extract. Beat until foamy. Stir in oil and flour, add milk. Add gin if desired. Mix well. The result should be a fairly thick pancake batter. Core apples, cut into ½ in / 1cm slices. Set non-stick pan over medium-high heat. Add 1 cup / 250ml of oil. Dip sliced apples into pancake batter. Coat well. Drop into pan and put 1 tbsp of batter on top of each apple slice. Fry until golden brown on one side, then turn and fry until golden brown on the other side. Remove from pan, blot dry with paper towels, keep warm. continue frying until all pancakes are done, add oil if necessary. Serve warm, optionally with a bit of cream and a few mint leaves. If you like this recipe "Apple Pancakes" by admin, please take a moment to share it with your friends.